His 2006 memoir may also be, unintentionally, the best book for Westerners about how manga is made today. Highly recommended. 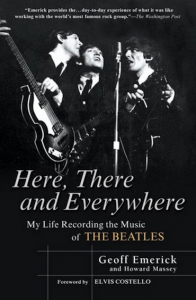 Here, There and Everywhere: My Life Recording the Music of the Beatles is a survey of the recording of many of the major Beatles albums from the recording room’s perspective, which is to say from that of Geoff Emerick, the band’s longtime engineer. It also provides a peek into some of Paul McCartney’s solo work, including an incident when the band was threatened by supporters of Fela, who felt McCartney might be in Lagos to steal his rhythms. The book is valuable for its insight into the creative life of the Beatles (who did what, how they related and — more to the point — didn’t relate with each other), but for two other key reasons as well. The first reason is the extent to which the engineer-as-composer is an underlying theme of the book. Emerick makes negligible claims to any traditional compositional activity — he doesn’t suggest himself to have written a major part, or to have penned a lyric — but his role in creating the recordings that we generally think of as the songs is paramount throughout. Initially he’s a technological interpreter of John Lennon’s mumbled and hazy requests for particular effects, and later he’s more of a direct instigator of such things. This book is essential reading for anyone who has a serious interest in musique concrÃ¨te, in Brian Eno’s pioneering ambient work, and in Glenn Gould’s studio seclusion. The second reason is more tangential, but I’ll mention it here. In many ways, Geoff Emerick’s book about working with the Beatles in the 1960s is the best book I’ve ever read about manga (Japanese comic books and graphic novels). It is by far the closest thing I’ve read to my personal experience observing how manga is produced today in Japan. This is because he gives a great presentation of how bands during the 1960s were signed to record labels and then how those bands’ music was produced in what was, in effect, a fairly traditionally managed business environment. That old-school business model, as with so many ancient mid-century norms (from workplace suits to institutional sexism to presumed lifelong employment), remains the way much mainstream culture is produced in corporate Japan, manga especially. The book was published in 2006, and I read it earlier this year, in March.